If getting in and out of your vehicle is less than comfortable, not convenient, and you often have to make leaps of faith just to get in and out then it might be time to change that. Queue the Carr black Hoop II truck steps. Manufactured using corrosion resistant aluminum alloy, Carr black Hoop II truck steps are built to last. That's a good thing because you'll be relying on these things to hold your weight and take a clobbering from your shoes, work boots, or other heavy duty footwear day in and day out. 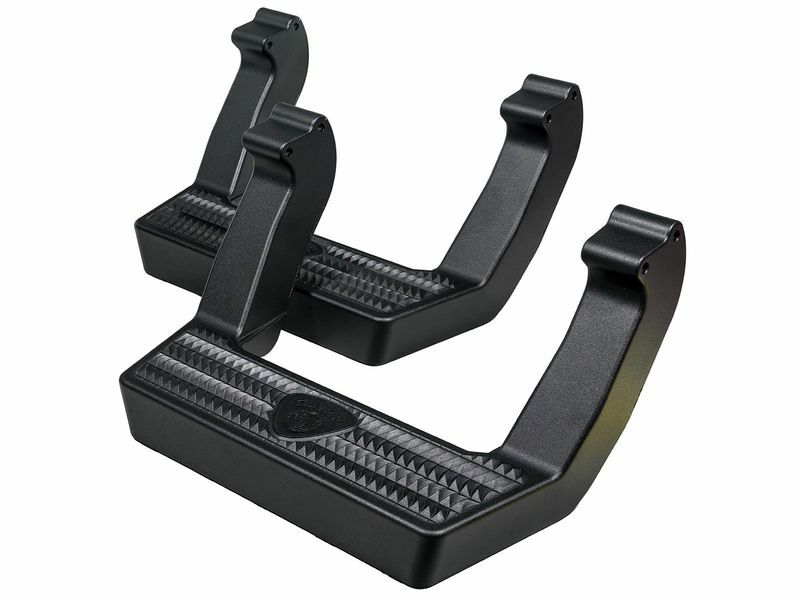 These steps also feature a rugged tread pattern that assures a safe non-slip stepping area and sure footing every time. They're available in a black powder coat finish and are resistant to scratching, cracking, and peeling meaning they'll add a stylish yet subtle flair to your ride that will last. Carr black Hoop II truck steps are compact in size, easy to install, and are backed by a limited lifetime warranty from the manufacturer. By installing a set of these steps you can rest easy and have peace of mind knowing they will provide a safe step up for years to come.